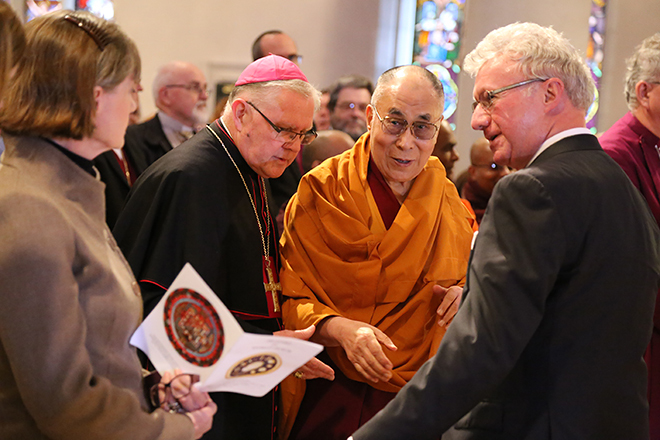 This is Archbishop Mark Coleridge’s welcome to the Dalai Lama and others gathered for a multifaith service for world peace at St Stephen’s Cathedral, Brisbane, on June 11. EACH religion speaks of the divine in its own way. Like many others here, I am a child of the Bible, and I welcome Your Holiness to this cathedral which is a monument to biblical religion. Older cathedrals in other parts of the world were constructed as the Bible in glass and stone for people who couldn’t read. St Stephen’s isn’t quite like that, but its roots lie there. Here the Bible speaks. The seed of biblical religion is the Exodus – the liberation of slaves from Egypt, which stands for all the totalitarian powers of the world through time. Such powers will always insist, “Once a slave, always a slave”; or in Dante’s words over the gateway to hell, “Abandon hope all you who enter here”. But the Bible speaks a very different word; it speaks a word of hope. The real God will not be owned or imprisoned by totalitarian powers; nor will this God allow the human being to be owned or imprisoned by them. This is the God who hears his people’s cry (Exodus 3:7) and brings hope to birth from what seems hopelessness. This is why we speak of divine transcendence, the uncontainability of God, which totalitarian powers will always reject but which the Bible defends most passionately. That’s why the Pharaohs of this world always burn or ban the Book. The transcendent God is infinitely other, all-holy. The entire creation with its millions of galaxies cannot contain him. The vast universe of the human mind and heart and imagination cannot contain him, let alone any political system or ideology of human making. None of the sorrows of this world can destroy the joy of God which courses through the universe; none of our miseries can deny us a share in the divine happiness; not all the world’s violence can cut us off from God’s peace. Joy beyond all sorrow, happiness beyond all misery, peace beyond all violence: this is the true and transcendent God whom we worship. Yet this God chooses to come close to those he has created, freely bridging the abyss of infinite otherness in an intimacy which is no less infinite. This is an extraordinary paradox, and it stands at the heart of biblical religion. Your Holiness, for as long as we can remember you have been a figure of paradox: a man in the world but not of it, a remarkable spiritual presence yet thrust into the political maelstrom, born of a very particular culture yet able to speak across cultures, a man of the beyond yet close to many, someone who has known sorrow but who can speak of happiness, one who has known exile but seems at home wherever. For long years, you have been witness to a deeply human hope; and that hope is always mysterious. It comes from somewhere else; it comes from beyond. In speaking of you as a witness to hope, I am reminded of Pope John Paul II, now Saint, whom Your Holiness met a number of times and with whom you seemed to have an affinity. The best known biography of him is entitled “Witness to Hope”. It shows clearly that, in his early life, Karol Wojtyla suffered under totalitarian regimes in ways that should have destroyed him, as it did so many others. Yet this suffering didn’t destroy him; it created him. It made him the radiant human being, the unforgettable witness to hope, that he became. You too have suffered many things that should have destroyed you. Yet they have not. Following the path of the Buddha, you have found a way beyond all that destroys, beyond violence to peace, beyond oppression to freedom, beyond cruelty to compassion. That’s why we welcome you today as a witness to hope. We may speak of the divine in different ways, but here we recognise that, beyond all the differences, we are united by the power of hope which brings true humanity to birth. Not only religious leaders are here but also civic leaders; this hope isn’t narrowly confessional or myopically religious but is universally human. Let this moment, then, be a celebration of the hope that is large enough for the human heart and worthy of God who is its source, the one who hears his people’s cry. Let that be the gift of this gathering to the city and to the world. Your Holiness, in the name of all who are here and many others, I welcome you among us. I greet you not as a stranger to this city or to this cathedral but – beyond all the politics and protests – I greet you as a fellow pilgrim, even a friend. Peace be with you. Click here to read the full story of the Dalai Lama’s historic appearance in Brisbane’s Cathedral of St Stephen.